Tuscany is Italy's fifth largest region and probably one of its most famous ones, known for its beautiful landscapes and its rich artistic legacy. 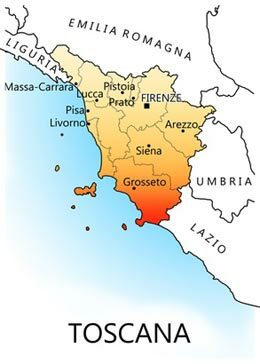 The region is widely regarded as the true birthplace of the Italian Renaissance and Italian language. Thanks to the prestige of the masterpieces of Dante Alighieri, Francesco Petrarca, Giovanni Boccaccio, Niccolò Machiavelli and Francesco Guicciardini the tuscan language became the language of culture for all the people of Italy. The area between the Arno and the Tevere was the territory of the Etruschis or Tuschi at the time of the ancient Romans . The name of the Region at that time was Etruria or Tuscia. 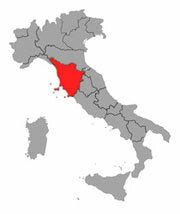 Subsequently Tuscia was transformed into Toscana (Tuscany). Tuscany has also been home to some of the most influential people in history, such as Botticelli, Michelangelo, Leonardo da Vinci, Galileo Galilei, Amerigo Vespucci and Puccini. The climate, which is fairly mild in the coastal areas, is harsher and rainy in the interior, with considerable fluctuations in temperature between winter and summer giving the region a soil building active freeze-thaw cycle in part accounting for the region once having served as a key breadbasket of ancient Rome. The summer months are the busiest time for tourism, so we recommend to avoid July and August. August is the month when all Italians go on vacation, so roads become really, really crowded. Additionally, you may find many restaurants and shops closed, especially in less touristic spots, in August. June and September still guarantee warm temperatures, but without the drawbacks of the Summer vacation months. Temperatures start to drop and tourist crowds to tin, making fall an ideal time to visit Tuscany. Colors are beautiful and many wineries start harvesting their grapes in this season, so, for wine lovers, this is an additional reason to visit this region in the period of the year. These are the months when you can find good deals, as this is typically the low season in Tuscany. This period of the year may require some more planning, as you may find many hotels and restaurants closed especially from December through February. March can be already pleasantly warm, but sunny days can alternate with rainy days and temperatures can drop abruptly. But it is the month when fruit trees are in bloom offering a beautiful sight. 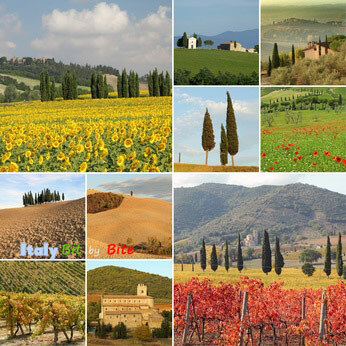 The early season is a wonderful time to visit Tuscany. No crowds and restaurateurs and hoteliers who, being at the beginning of the tourist season, will be more enthusiastic than ever to deliver that extra touch. The Tuscan countryside is beautiful in May.